Mumbai got well acquainted with the Mithi when the choked river overflowed onto its streets during the 2005 deluge. A decade later, the city is still trying to clean up the mess. Household waste entering Mithi in the slums of Bhim Nagar. 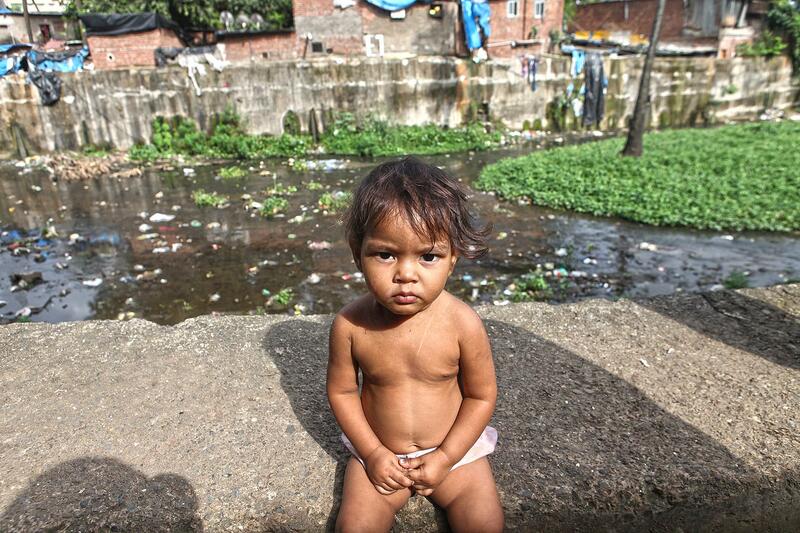 Kaleshwari Devi, her taxi driver husband Rajesh and their two children have been living in Mumbai’s Morarji Nagar slums, adjacent to the Mithi river, for more than two years. Rain is not Kaleshwari’s biggest worry – it's the absence of it that is more of a concern. She said that when it doesn’t rain, the stagnant water becomes a breeding ground of mosquitoes that carry deadly diseases such as malaria and dengue. As we were talking, electricians installed two exhaust fans in their shanty home to help fend off the stink from the river. The family uses mosquito coils and repellents throughout the day. 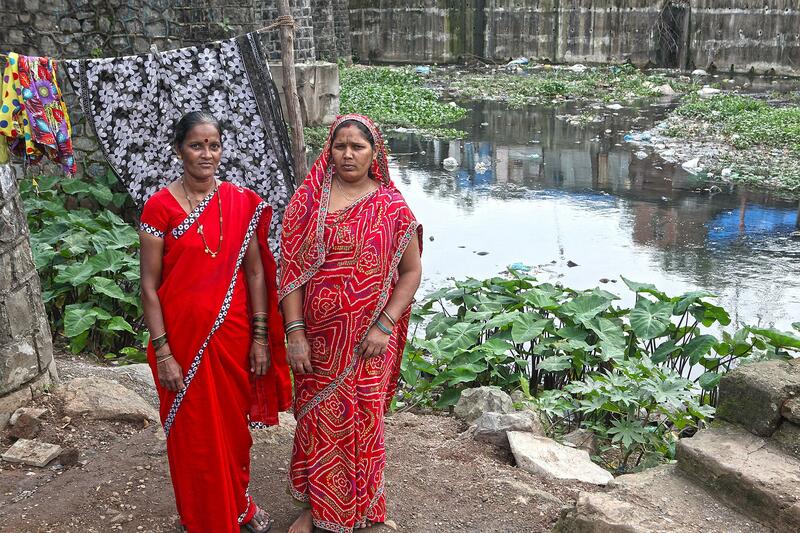 Kaleshwari Yadav (right) poses outside her home along the river at Morarji Nagar. 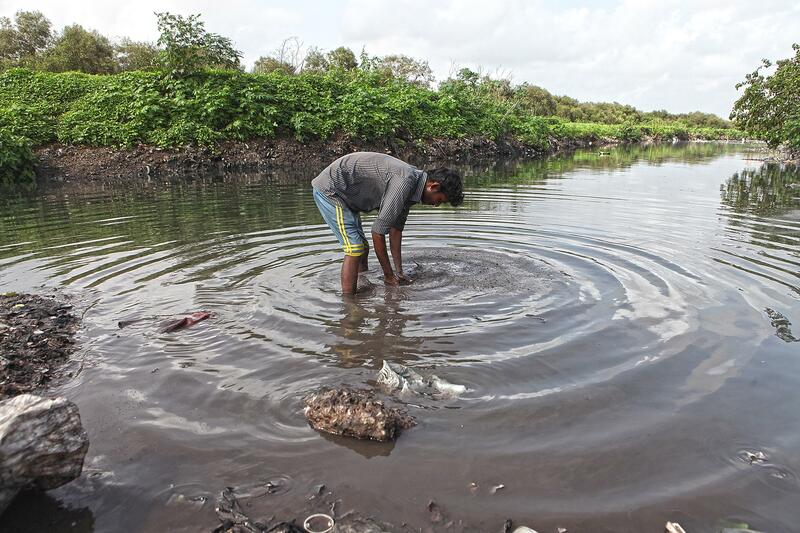 One of the oldest rivers in the state, the Mithi is now nothing more than a sewage drain. In July, Maharashtra Environment Minister Ramdas Kadam declared that the stream consisted of 93% domestic sewage and 7% industrial waste. The polluted river and the destruction of mangroves are cited as one of the primary reasons for the July 26, 2005, deluge in Mumbai. 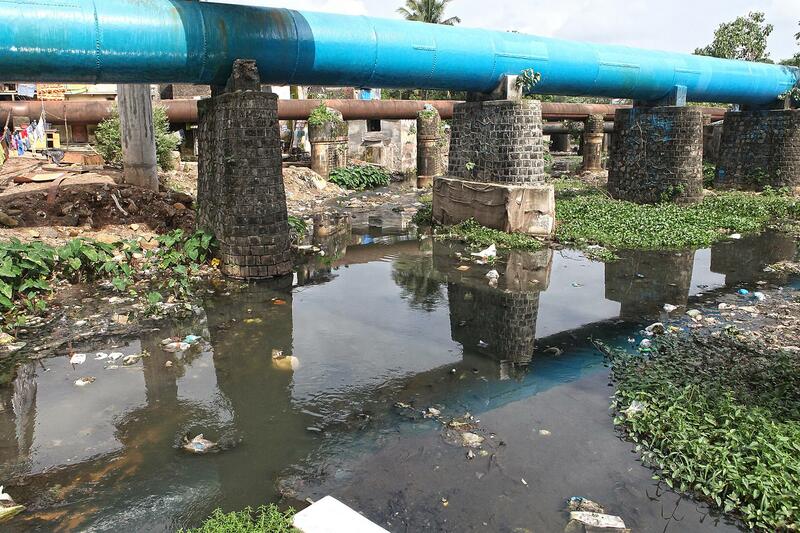 The Mithi is a critical storm water drain for Mumbai. But as torrential rain hammered the state for four days, lakes began to overflow into the Mithi. 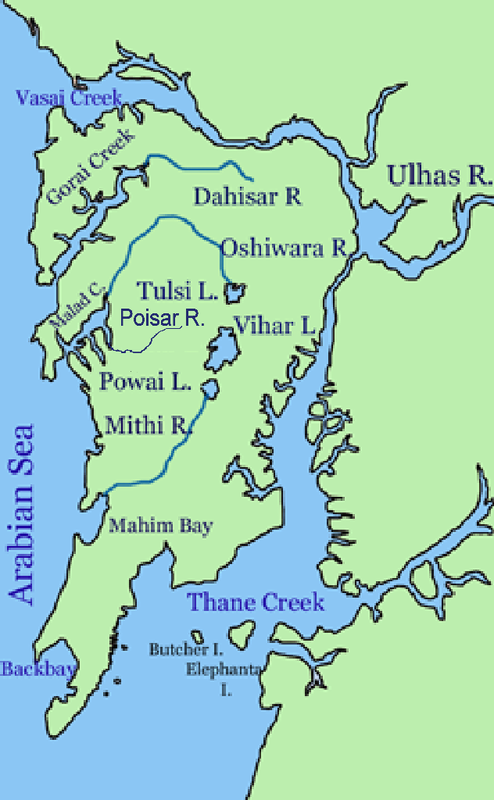 The Mithi flows 17.8 km before draining at Mahim Bay and into the Arabian Sea. Its journey includes cramped slums and squatters at Morarji Nagar, Bhim Nagar, Dharavi, and the industrial and residential complexes of Powai, Saki Naka, Kurla and Mahim. Morarji Nagar constitutes its north end. 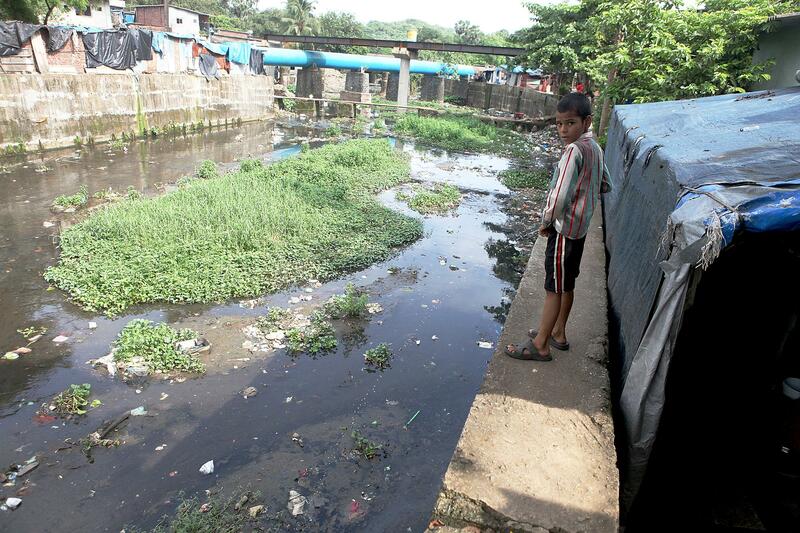 A young boy urinates in the Mithi river while walking back home in Bhim Nagar. 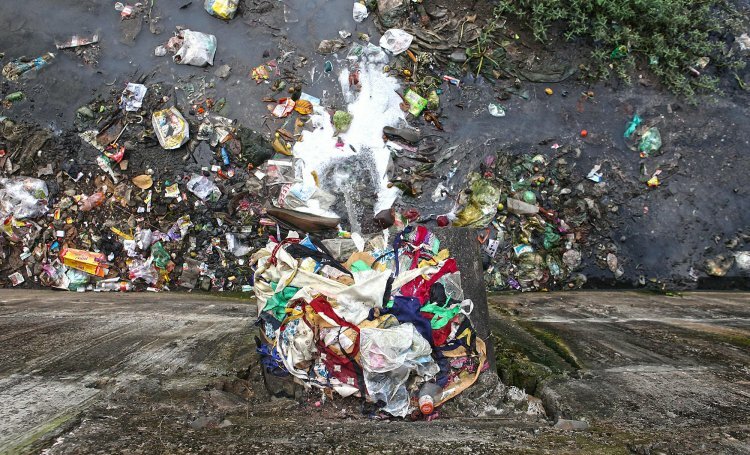 Clogged with plastic, garbage and sewage, the river couldn’t bear the load. 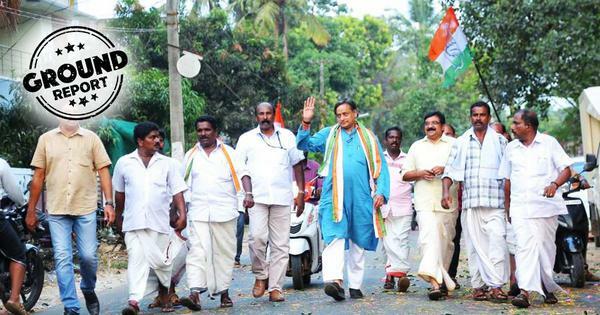 Instead of flowing downstream into the Arabian Sea, the floodwaters seeped onto the streets of the city, along with gallons of waste. Freshwater pipeline passing above the Mithi river at Bhim Nagar. Flowing at an altitude of 246 metres above sea level, the Mithi originates in the hills to the east of the Sanjay Gandhi National Park. It also gathers water from discharges of the Powai, Tulsi and Vihar lakes. The river drains at Mahim Bay and into the Arabia Sea. 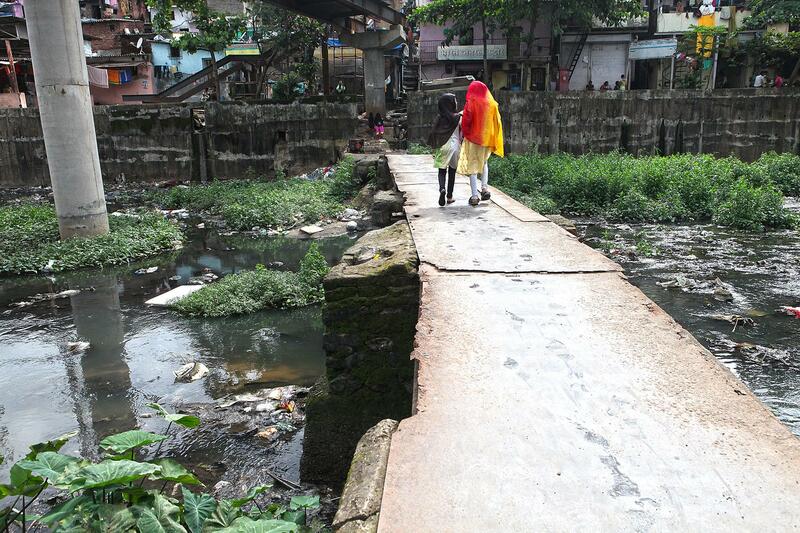 Two young girls walk on the makeshift bridge over the Mithi river at Bhim Nagar. According to a Central Pollution Control Board report released this year, half of India’s rivers fall under the “polluted” category. 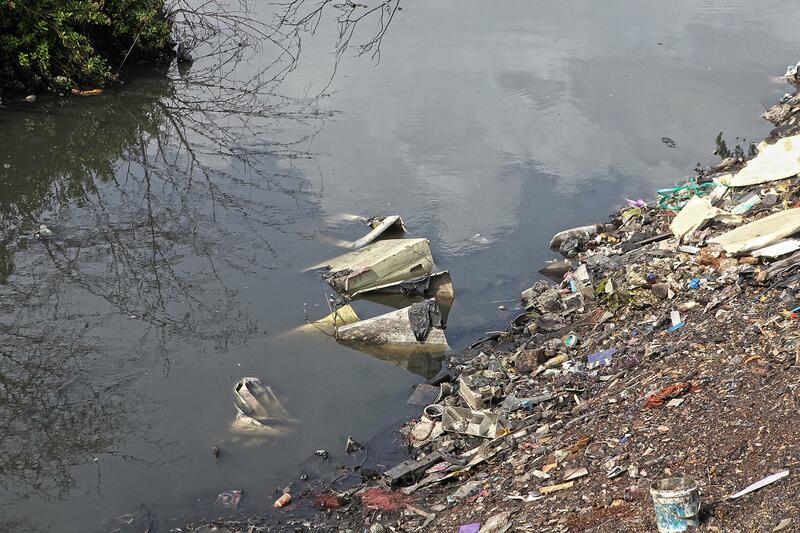 Unregulated dumping of waste and sewage poses a major threat to rivers. Most rivers in the country are polluted to some extent. 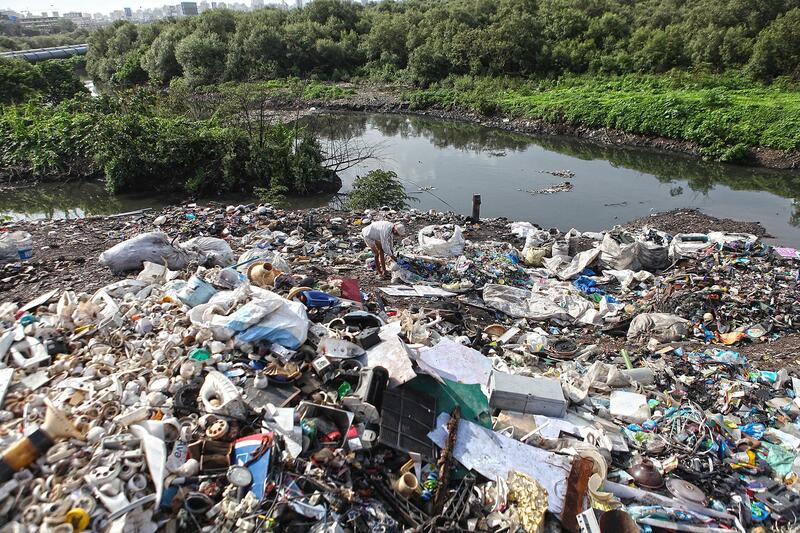 Solid waste at the banks of Mithi river at Bhim Nagar. The ever-expanding urban sprawl has caused the Mithi to narrow further. 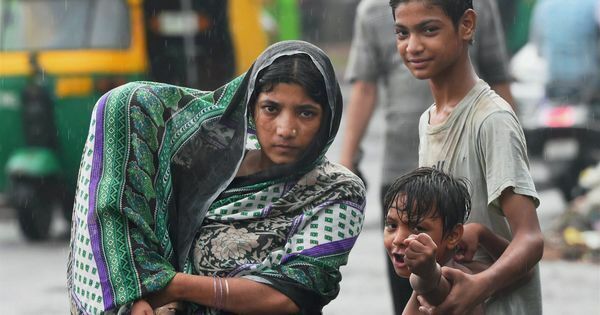 Dharavi, an informal economic powerhouse with a population estimated between three lakh to 10 lakh, is situated along the fringes of the river. Dharavi is one of the largest waste recycling centres in Asia, taking in electronic and plastic waste from across the world. 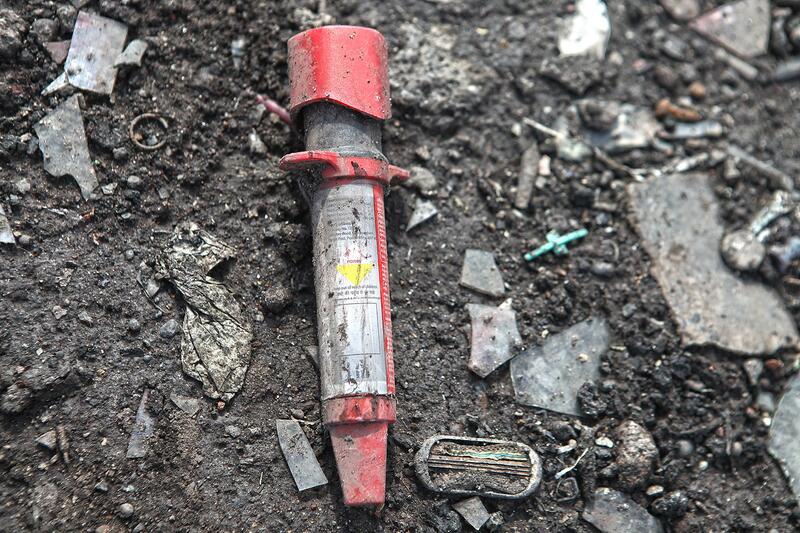 A tube of rat poison washed to the shore of Mithi river near Mahim. Vikas is responsible for washing waste for these recycling centres. In his mid-twenties, he stands knee-deep in the Mithi daily for seven to eight hours to clean and segregate the sellable metal and plastic waste. He washes 16-20 bags of waste every day, earning Rs 25 for each. Skin infections are an occupation hazard for him and oil is his only ointment. “These problems are part and parcel of surviving in the big city,” he said. 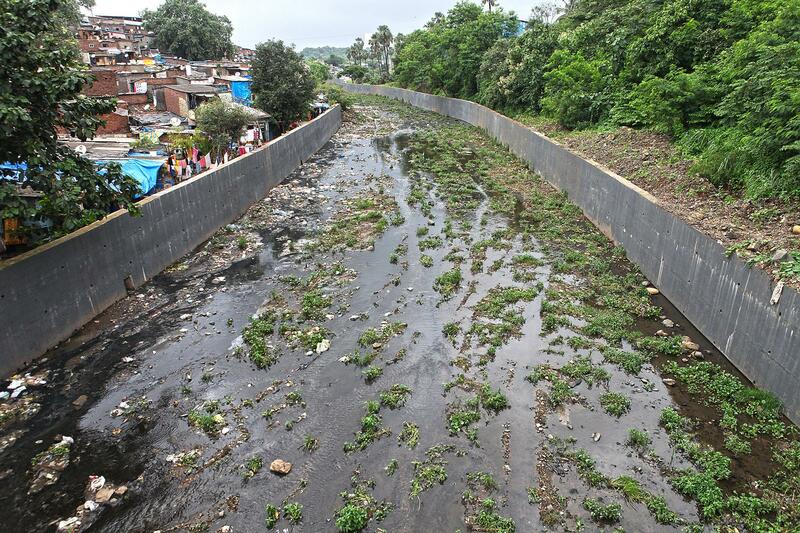 The Mumbai Metropolitan Region Development Authority, the city’s planning body, was given the task of desilting and revamping a 6-km stretch of the Mithi by December 2014, with Rs 501 crores allocated for the purpose. 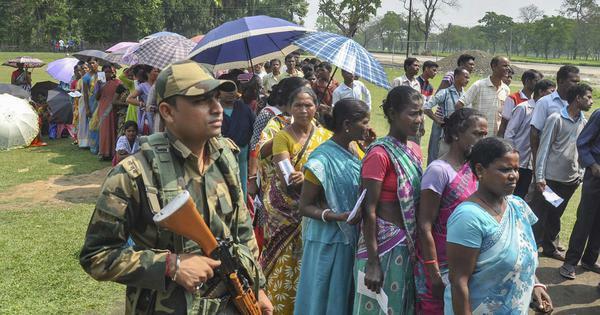 While authorities claim that 90% of the work has been completed, the project turned controversial when environmentalist Stalin Dayanand raised some concerns. He claimed that the newly constructed retaining walls along the sides of the river endanger the mangroves and were built without prior permission from the environment ministry. Waste lying on the banks of Mithi river waiting to be burnt or sold to recyclers. Retaining walls along the river near its origin at Vihar lake. The city’s civic body, Brihanmumbai Municipal Corporation, intended to finish the desilting by May. However, the river flooded this monsoon as well. While desilting is three quarters of the way through, the future of the Mithi remains is in peril unless the authorities can prevent citizens and industries from dumping waste, oil and industrial sludge into the river. The Mithi's story is not an unfamiliar one. According to a Central Pollution Control Board report released this year, half of India’s rivers fall under the “polluted” category. Unregulated dumping of waste and sewage poses a major threat to rivers. Most rivers in the country are polluted to some extent. 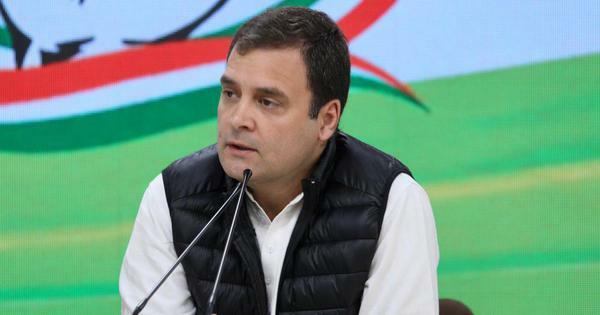 But the Central government has focused its attention only on a select few. Crores of rupees have been set aside to revive these rivers. But lack of implementation means these water bodies continue to deteriorate, leaving India with more sewage drains than freshwater stocks. All photos courtesy Rohit Sharma. 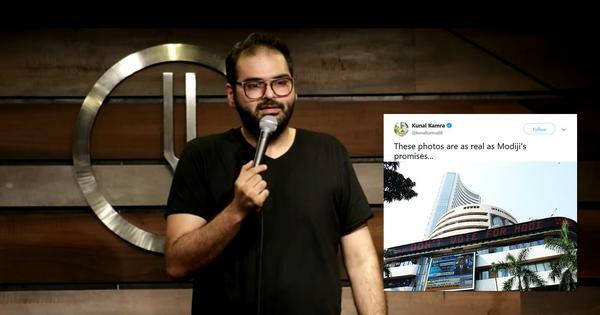 Rohit Sharma left his job with a global bank to pursue photojournalism. Now, he is a freelance photojournalist based in Mumbai. He is passionate about covering socio-environmental issues prevalent in today's times. Arpita Bhagat is a writer, researcher and environmentalist with special interest in community building. She is the co-founder of The Kachra Project. She tweets at @latentappy. This article was originally published on India Water Portal.